This week has been pretty boring overall. The weather has been overcast and gray, although we didn't get the rain that I had hoped for, just a light drizzle that didn't even wet the ground. Monday I harvested my experimental crop of green chickpeas. I only planted 8 square feet, so I didn't get a huge yield, but it should be enough for a good taste. (Even for that one bowl, it took two hours to shell them all.) I ate a few raw, which were pretty yummy. I blanched and froze the rest to keep them until I can decide how to prepare them. Tuesday I took a number of strawberries out of their pots and planted them in areas of the back yard where I don't have to walk. I'm hoping they'll form a nice edible groundcover and help shade out the weeds. I then used their pots for ground cherries, which I moved to the front yard. I'm hoping that they will do better there than the one poor little plant that I relegated to the back end of the back yard last year. I discovered that two of the asparagus crowns that I planted last year have survived, despite the abuse they suffered by being buried too deeply too soon. If I'm lucky, they'll be able to store up some energy and come back bigger and stronger next year. I weeded and discovered all of my asparagus seedlings survived the winter! They may be tougher than I thought. That's great! I hope they produce well for you for a long time. Do the green chickpeas taste the same as the canned kind? Are they actually green after you shell them? Or do you just call them that because you're not drying them? Do the green chickpeas taste the same as the canned kind? Canned green chickpeas? (I don't think I've ever seen that as a product.) Or dried chickpeas that have been cooked and then canned? The green chickpeas don't taste anything like regular dried chickpeas. They're faintly sweet, though not as sugary as snap peas. Kind of like a cross between peas and asparagus. Are they actually green after you shell them? Or do you just call them that because you're not drying them? The picture shows what they look like immediately after being shelled. 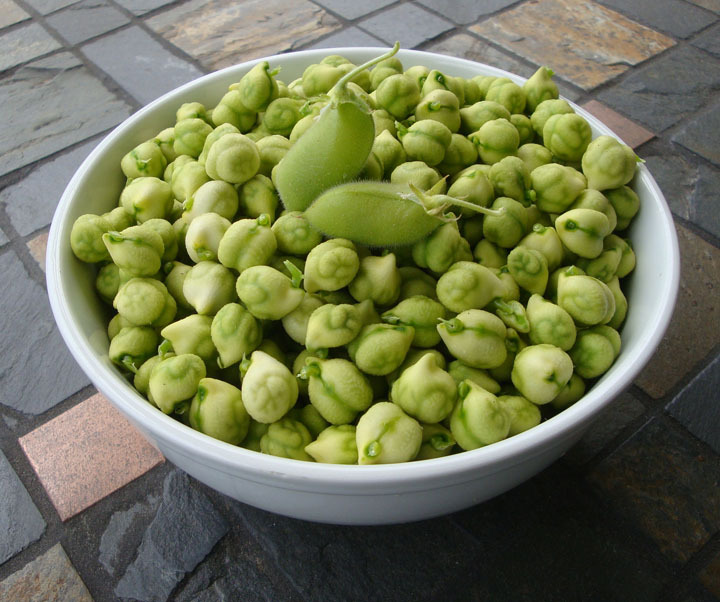 When blanched, they turn bright green (like typical frozen peas). The picture shows what they look like immediately after being shelled. Haha, wow, I feel really dumb. I was actually wondering why most of the pods looked so tiny. Now that you say that, it's totally obvious. I don't know anything about growing beans. I am planning many detailed posts about beans this year...so I'm sure you'll pick up a thing or two.